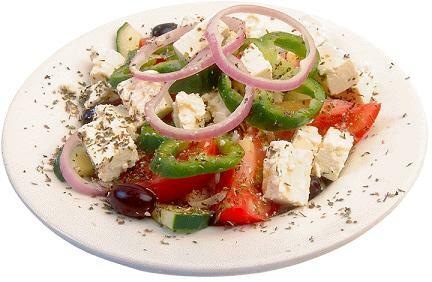 Greek salad, which is known Greece and Cyprus as "country salad" or "village salad", is an easy to make an enjoyable salad dish. If you are using lettuce, tear it into pieces and place in salad bowl. Chop the tomatoes into quarters, then cut these into halves and add to the salad bowl. Peel and slice the cucumber, and add the slices to the salad bowl. Add the olives to the salad bowl. Peel and slice the red onion, and the slice the bell peppers, and add to the top of the salad. Sprinkle crumbled or grated feta cheese on the top. Note: Overseas adaptations of the recipe often use much larger amounts of feta than Greeks and Cypriots typically do. However, when making the salad yourself, you can of course use as much or as little feta as you want. Season with salt, black pepper and oregano to your taste. The dish should now look attractive and be ready to serve. Before eating, drizzle with olive oil and red vinegar. You may also wish to toss the ingredients.